If becoming an airline pilot is your career objective, learning to fly an actual airplane is not the most difficult part. The technical aspects of piloting an aircraft—even large, commercial jets—can be mastered by most anyone committed to doing so, but being put in charge of an airplane, its crew and passengers, and its cargo is about more than just those technical aspects. Gaining the necessary experience requires a significant investment of time and money. Aircraft technology has become so advanced that it's become cliche for people to say airplanes fly themselves. And that can be true when everything is going according to plan, but everything doesn't always go according to plan. Airline pilots need to have the capacity to handle large aircraft and to make decisions with the best interests of all on board, and they need to be able to do so in adverse conditions. So, in addition to flight experience, a well-rounded education is important for prospective airline pilots. Airlines also value pilots who have experience flying for the military and the leadership skills that often come with that. Large, commercial airlines require pilots to have bachelor's degrees. Some smaller, regional airlines might require no more than a two-year degree, but if your goal is to one day captain a large, commercial jet, get your bachelor's degree. It doesn't necessarily have to be an aviation-related degree, but if you know early on that being a commercial airline pilot is what you want to do, that might be your best option. Prospective airline pilots won't meet all of these requirements just by attending flight school or an aviation program at a university. A common path toward earning the necessary hours and gaining valuable experience is working as a flight instructor. There is more than one path toward learning how to fly a plane and becoming licensed to do so. Which option is best depends on your own circumstances. Part 61 or Part 141 Flight School: Flight schools are categorized as Part 61 flight schools or Part 141 flight schools. These refer to FAA regulations, and Part 61 details the requirements for the certification of pilots, while Part 141 describes the regulations surrounding pilot schools. Part 61 flight instruction is the least regulated, making it the most informal and often the least expensive option. Instructors at Part 61 schools can conduct training in the manner they choose, without much oversight from the FAA. Part 141 flight schools, on the other hand, must adhere to a strict training outline that has been approved by the FAA. Both training methods might offer a casual, at-your-own-pace environment, but Part 141 training is known to be a bit more fast-paced. Most flight schools offer training on nights and weekends. Aviation College or University: The obvious benefit of attending a college or university with an aviation program is to earn a four-year degree while learning to fly. Coursework consists of aviation-related classes geared toward career pilots, and the quality of training is high. Universities might provide students with professional experience and the most up-to-date technology and equipment in the country. The disadvantage of collegiate programs is the cost, but scholarships and other types of financial aid are available to help offset tuition and flight costs. Consider joining a professional aviation organization in your community, such as the Experimental Aircraft Association (EAA) or the Aircraft Owners and Pilots Association (AOPA). They often offer scholarships and free training seminars. Aviation Academy: Aviation academies offer a way for students to gain the required pilot certificates and knowledge in a short amount of time. 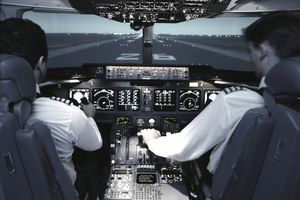 These programs often train people to be airline pilots in a year or two with condensed coursework and intense airline-oriented training under a Part 141 program. Many times, these companies partner with airlines to offer guaranteed job interviews to graduates. The biggest drawback is the cost, as aviation academies are the most expensive option. Military Aviation Career: A military aviation career can ease the financial burden of flight training, with the tradeoff being about a 10-year commitment to the military. Since the cost of training is covered, this a desirable option for some. In addition to the financial benefits, military pilots can enjoy traveling the world while gaining experience flying large aircraft. Becoming a military pilot means facing stringent acceptance requirements, both physically and mentally. The drawbacks of becoming a military pilot include the long commitment, a lot of time away from home, and the likelihood of deployments. When the commitment is complete, the job outlook generally is very good since military experience is highly desired by airline recruiters. Once hired by an airline, the only way to earn seniority and an eventual promotion to captain is to put in the time. Because airlines naturally want their most experienced pilots to be the ones captaining their jets, expect to spend several years as a first officer. Once you are promoted to captain, be prepared to put in more time before earning the most preferred schedules. Expect to earn seniority by flying at night and on weekends.